Here's the kind of image St. Louis loves to flaunt. Here's a less flattering view. And here's two more photos of the Arch grounds taken from the Arch. 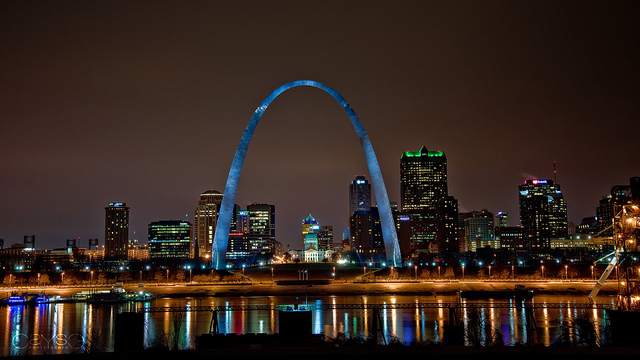 I do think the Arch is beautiful, but other than that, I'm at a loss for compliments. To me, it's this big, static thing that -- at the end of the day -- encourages nothing more than looking and leaving. (And I can look at it from far more engaging places in the city.) The Arch grounds are strangely confusing to access by foot or by bike due to the "massive physical barriers that completely sever this prized public space from the rest of the city: To the west, I-70, a rumbling interstate offering limited and unsightly pedestrian access, and to the east, the Mississippi River, prone to flooding, and dividing downtown from blighted East St. Louis" (FastCo Design). I'm neither the first to notice nor the first to complain about this shockingly embarrassing American monument. How it existed in its current state for so many years is mind-blowing. But change is on its way, for better or worse. 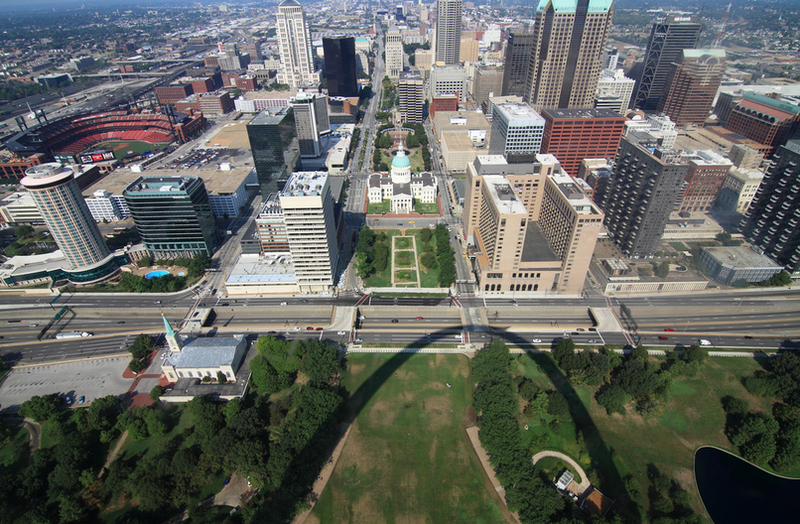 By October 2015, the 50th anniversary of the Arch, St. Louis should see a one-block "lid" over the highway; an expanded museum with more (and hopefully improved) exhibits; a riverfront promenade with access for bicyclists and pedestrians; and new and improved spaces and pathways. That all sounds good. Or does it? Alex Ihnen, editor of the fantastic blog NextSTL, posted a detailed timeline of the CityArchRiver project from 2010 to present, and he argues, quite convincingly, that the "lid" as currently proposed disrupts downtown's city grid and even worsens access to the Arch. Even if the "lid" is a disaster, the Arch has so much room for improvement that I can't see being disappointed on every front.